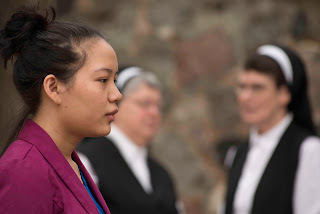 Before the Triduum and in the midst of the Easter Season, Franciscan Sister of Christian Charity are offering a variety of discernment days of reflection in a variety of locations. We seek earnestly to allow the Holy Spirit to move among us so that others may know the beauty of their own call from God. Franciscan Sisters of Christian Charity serving in Cambridge and Zanesville, Ohio invite single young adult Catholic women to a Franciscan Discernment Day March 24, 2018 focused on this St. Francis of Assisi quote: "Start by doing what is necessary; then do what is possible and suddenly you are doing the impossible." Day begins at 9:30 a.m. or with optional Morning Mass at 8:35 a.m.. Lunch will be provided. Expect moments of prayer together and alone. Day closes a 4 p.m. with Evening Prayer. There is an optional opportunity for the Sacrament of Reconciliation and a Eucharist for Sunday at 5 p.m.. To register click here. For more information call or text Sister Julie Ann at 920-323-9632. Franciscan Sisters of Christian Charity invite you April 7, 2018 to a silent Discernment of Spirits retreat designed especially for you at St.41903 Wilson Memorial Dr., Chassell, MI. Anne Church, Iron Mountain, MI. 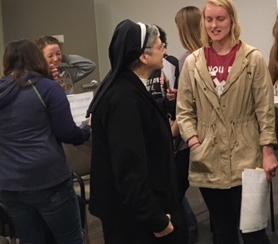 Franciscan Sister Jacqueline Spaniola, OSF leads the retreat based on St. Ignatius’ discernment process to guide single, young adult Catholic women in understanding God’s will for your life. Day begins at 10 a.m. and closes with Mass at 5:30 p.m.
We will happily take time for questions and answers. There is no cost for this retreat, but registration is required. For more information call or text Sister Julie Ann at 920-323-9632. Register. 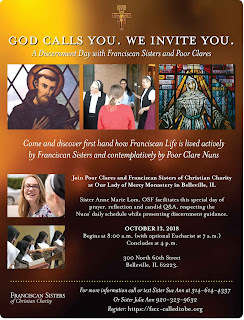 Franciscan Sisters of Christian Charity and Cistercians Nuns invite you April 21, 2018 to a day specially designed for single, young adult Catholic women to provide tools to discern your calling. 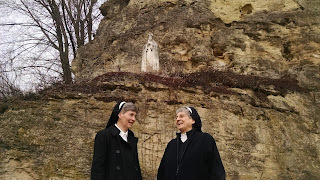 Franciscan Sister Jacqueline Spaniola leads the retreat, based on St. Ignatius’ discernment process to guide you in understanding God’s will for your life at the Valley of Our Lady Cistercian Monastery, Prairie du Sac, WI. Day begins with Mass at 8 a.m. and closes at 4:30 p.m. with the option of praying Vespers with the Nuns at 4:45 p.m.. There is no cost for the retreat, but registration required. Click here to register.